One element of the Ground Truth 2.0 project is the collection of data for the purpose of environmental analysis. Tygron participates in two demonstration cases that are quite different, but have similarities at the same time. In both, the Belgian Case in Mechelen and the Swedish case in Flen, data are gathered by motivated volunteers who want to support and maintain their living environment. The data that they gather in the citizen observatories will be combined with open GIS data for 3D scenario planning. The resulting scenarios can be used in participation and decision-making processes. 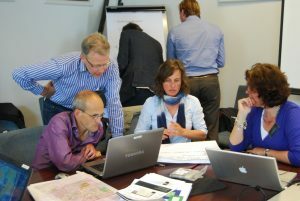 The 3D planning software of Tygron is often used in projects in the Netherlands, both for rural and urban spatial planning. 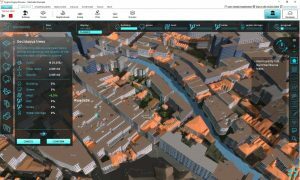 The software makes use of open data sources to build a realistic 3D world that can be used for scenario planning. 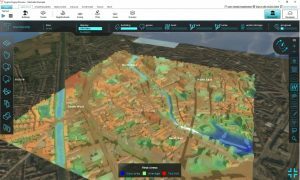 For Ground Truth 2.0, GIS data were used to create the city of Mechelen. The Swedish demo case is almost ready to start creating this 3D world. Based on the first test results some improvements are implemented in the Tygron Engine to support the two demo cases. One of the improvements is the new GIS wizard. With the wizard it is much easier to import data that are needed to build a project outside of the Netherlands. After creating the 3D world, the next step can start: adding the collected data from the citizen observatories and the stakeholder information. The GIS wizard will make this step easier as well. The ultimate goal of the software is to use it for scenario planning. The scenarios build on the combination of the open GIS data and the citizen data. The same 3D world can be viewed from different stakeholders’ perspectives, each with their own interests and goals. When a future planning scenario is activated, the effects of the scenario are visualized and calculated for all stakeholders. Therefore, positive and negative results from each stakeholder’s perspective are identified early on in the decision-making process. The outcomes are used as input for multi-stakeholder dialogues between the involved parties. The Belgian demo case is located in Mechelen, a typical urban area. The main focus is to map air quality and traffic noise. The Tygron software will use the collected data for scenario planning during the decision-making process. The citizens measure air quality and traffic noise as input for the ‘ground truth’ scenario. Future scenarios will be calculated and visualized to get insights in the effects of certain interventions in the city of Mechelen on the air quality and traffic noise. Together with local governments, citizens and other stakeholders, new strategies and policies can be made based on real data to improve the living environment by working on climate adaptation and/or -mitigation. The Swedish case is located in Flen, a rural area near Stockholm. The main focus is to map water quality in this area, and central questions are the current state of the water quality and the factors influencing it. Based on water samples that citizens gather during events like the Blitz, the quality is mapped out. The environmental aspect is included in the Tygron Engine to help make future scenarios. With these scenarios it is possible to find the factors that have the largest impact on the water quality, and the interventions that create the largest positive results. The visualized and calculated effects on the environment will help the involved stakeholders during the decision-making process to find solutions that have the most impact and that are widely supported.